Grayton Beach gulf front home for sale. Located in the community of Gulf Trace, this 30A gulf front home features 10 bedrooms, 10 bathrooms, 80 feet of gulf frontage, over 1/2 an acre of land, expansive porches with panoramic gulf views, and 5,096 sq. ft. of heated and cooled space. This incredible income producing property consists of two homes under one roof which may be rented as one or separate units. Minutes from Watercolor and Seaside this gulf front home wont last long! 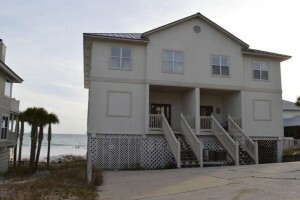 Call us today to see this Grayton Beach gulf front home.